The saxophonist Donny McCaslin has been steadily adding to a body of work that is firmly establishing him as a powerful voice in modern creative music. As a in-demand sideman on such interesting recent efforts like Ryan Truesdale's Gil Evans Project Centennial , a valued member of trumpeter Dave Douglas's Quintet and Maria Schneider's Orchestra, or on his own recent impressive efforts as a leader on albums like Recommended Tools, Declaration and Perpetual Motion, watching McCaslin mature is like watching a seedling develop into a mighty oak. As with any artist who is pushing his boundaries, there are moments of brilliance and moments of disappointment, but for the most part McCaslin has consistently moved the bar higher and higher. If music as art has the higher purpose to move its audience, then certainly McCaslin is a successful artist, as he seems to do so with a force of nature approach to his instrument. His latest offering Casting for Gravity is a case in point. After dipping his toe in the waters of electro/acoustic music in his last album Perpetual Motion, McCaslin has decided to explore what full integration into electronica can bring to his musical palette. He wants to make music that can utilize, as he says, "...more sonic layers" which he hopes will challenge him into deeper exploratory terrain. It may also be a way for him to expand his following by tapping into more modern musical influences and fusing them with his own brand of artistry. Lord knows jazz needs to expand its musical audience. McCaslin claims influence for some of this album came from Britiish electronica musician Richard D. James, who performs under the pseudonym of Aphex Twin and from the Scottish duo Boards of Canada whose song "Alpha and Omega" he uses as the jumping off point for his own jet fueled excursion. I am particularly taken by McCaslin and Guiliana together in such pieces like the ever ascending "Stadium Jazz" and the staccato "Tension." It is as if these two atomic reactors combine in harmonic resonance creating a fusion like implosion of energy. Lindner's driving piano and synthesizer and Lefebvre pulsing bass work in lock step to produce the firm rhythmic background that allows these two seemingly unstoppable forces to probe forward into the abyss. "Losing Track of Daylight" is perhaps the most groove-based of the compositions, with LeFebvre's pliant bass lines leading the way behind Guiliana's in-the-pocket playing. Lindner's expansive keyboard creates an airy, floating sound that dances over cloud like layers of shimmering cymbals and snapping snares. McCaslin honks his way in a playful but penetrating display of horn dynamics. The multilayered "Alpha and Omega" is a demonstration of "the layered sound" that McCaslin is trying to create. With its repeating saxophone and synthesizer motif setting the landscape for Guiliana's explosive drum outbursts the mood created is eerily hypnotic. On Binney's crescendo building "Praia Grande" the group dynamic is at its most unified, and McCaslin's tenor soars with unrestrained energy and unbridled passion. The title track "Casting for Gravity" has LeFebvre playing the opening line on his electric bass in a guitar-like riff with Guiliana's cadenced drum work reminiscent of the early electronica group Portishead. McCaslin slowly enters with a repeating serpentine saxophone call that pre-dominates the rest of the tune to its coda. "Henry" is a softer more introspective piece named after McCaslin's infant son. Sensitively played by Lindner on an electric piano with a distinctively dreamy sound. The group seems to find an inner gentleness on this one that is quite compelling. 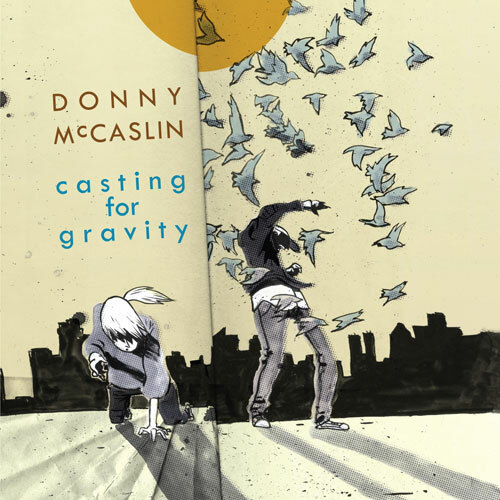 McCaslin's warm, probing sound is fluid and emotive; a father's tender call out to his son. As the group warms up to the increased tempo, the intensity follows but never upstages the underlying love that seems to pour from McCaslin's horn. In many ways McCaslin's journey into electronica is like a journey into the unknown. He is Casting for Gravity when he goes into this realm. It will not be for everyone, but it is a courageous, powerful musical statement that has moments of brilliance. It may prove to be an important portal for expanding the shrinking jazz audience. Here are two cuts from the album "Stadium Jazz " and " Alpha and Omega"